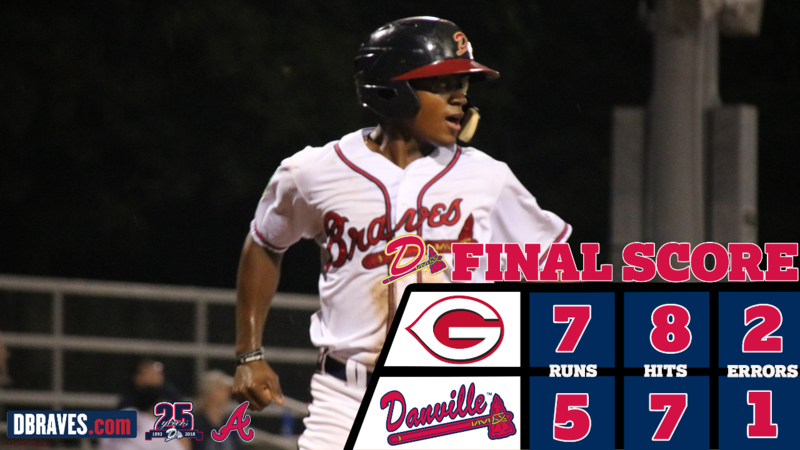 DANVILLE, Va. - The Danville Braves gave up seven runs in the fifth and sixth innings, which ultimately washed out their chances of a comeback in a 7-5 loss on Saturday night at Legion Field. Greeneville outfielder Edwin Yon launched two-run homeruns in back-to-back innings of D-Braves pitcher Jake Higginbotham to right-center and left-center field, driving in a combined four runs and contributing to a 7-3 mark for Greeneville by the top of the sixth inning. Nick Shumpert knotted the game at 3-3 with a solo homerun to left in the bottom of the fifth. The homer was Shumpert's third of the year and contributed to his 2-for-4 night. Danville scored the last two runs of the evening, but it wasn't enough. Justin Smith narrowed the deficit to 7-4 with an RBI double to left in the bottom of the sixth inning. Smith has now reached double digits in RBIs with 10. Michael Mateja drove in a run for the second straight night with an RBI single the other way to cut the game to 7-5. Mateja went 1-for-4 on the evening. The D-Braves missed out on a bases-loaded situation in the bottom of the seventh as Smith flew out to left-center field. Danville opened the game with the lead for the 31st time in the 2018 season. Luis Mejia drove in the game's first run with an RBI single down the right field line. Henry Quintero gave Danville a 2-0 lead two batters later with an RBI double down the line. Tanner Lawson was excellent in his ninth start of his professional career. In three scoreless innings, Lawson struck out five Reds, walking none and giving up just one hit. Danville loses its fifth straight for the second time this season. Danville will return to Legion Field for the final series of its 2018 campaign in a series with the Bluefield Blue Jays on August 21-23. Tickets can be purchased at www.dbraves.com.